Water damage is common to almost every house, and the most common locations for such damage include the bathroom and kitchen. When kitchen water damage occurs, it is almost always the failure of a water line, either incoming or outgoing, and the resulting leaks can be substantial. Dishwashers are one of the more heavily used appliances in the kitchen and may be responsible for cases of water damage that may affect cabinets, flooring, and even drywall. Leaks may become apparent through signs of water stains on the floor around the unit or corroded or worn water lines made brittle through exposure to water leaks. Cabinets that come in contact with the dishwasher may appear stained, warped, or even cracked, a sure sign that water is escaping from some point close by. When addressing dishwasher water leaks, you need to determine if the leak is coming from inside the door liner, underneath the door, or out through the door gasket. Placing towels on the floor around the unit and running it for a few seconds will help to determine the source of the problem. The first thing to check on is whether or not the unit is properly installed and sitting level. Level should be checked from back to front and side to side for an accurate reading and adjustments made as necessary. If the unit is improperly installed, it may result in the plastic interior warping and causing water leaks. Make sure the water level in the dishwasher comes up to the bottom edge of the heating element by opening the door after it fills with water and starts spraying. If the unit is not level, then the water will not be level with the heating element. 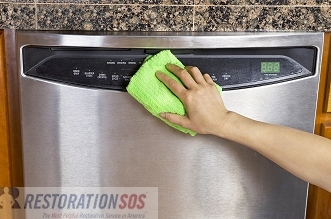 If the dishwasher is leaking soap suds, shortening can be used as a curative. Liquid dishwashing detergent is the common culprit. Remove the dishes and then use a bowl to scoop out as much of the suds from the unit as possible. Then put two or three tablespoons of vegetable shortening in the bottom of the dishwasher and run one complete cycle. Add dishwashing detergent and run another cycle. Make sure the door liner is properly centered within the door gasket. Misalignment of doors and gaskets can result in serious leak problems. Likewise, cracks, tears, and shrinkage of door gaskets may be responsible for water leaks from your dishwasher unit. The wash arm may also develop splits, resulting in water being pushed up at high pressure directly at the door and through the gasket. The cure is to run the dishwasher to heat up the arms and then look for splits by twisting both ends of the arm assembly.